The round straw lid part on both sides of a straw bundle of rice (tawara 俵). These bundles were very important to the farmers, collecting the grains after the harvest for tax purposes. 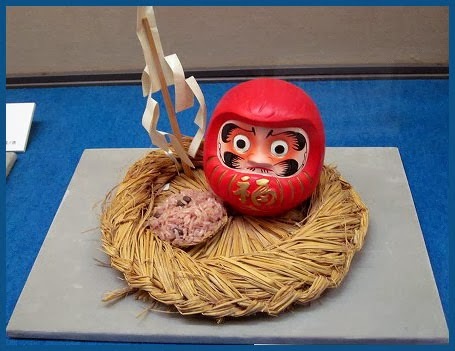 The round lid was used to place some dolls as offerings to the God of Smallpox and send them to flow down a river (nagashibina), hoping the Smallpox Deity would float away from the village. This lid was a sacred item to connect the world of men to the world of the Japanese gods. Click on the PHOTO to see some more. pen-name of Akamatsu Masatsune, a writer of "Crazy Poems, Comic Tanka Poems" kyoka 狂歌, in the Edo period. His books have been published by Tsutaya Juzaburo. In 1799, he compiled a colletion of "Crazy Poems from East and West" 狂歌東西集. The god of wealth, Daikoku, is often depicted standing of these bales of rice. Lewis Mackenzie believes that Issa is punning in this haiku, alluding to the poet's wife, Kiku (Chrysanthemum). This hokku was written at the end of the 11th month (early January) in 1815. "Large chrysanthemum" is the name of a tall, large-petaled variety of chrysanthemum, so I take Issa to be talking about one (or more) of these showy flowers, perhaps a large chrysanthemum raised by one of the haikai students with whom he was staying late during the 11th month according to his diary. It's rather difficult to raise chrysanthemums in the snow country, and the owner of the chrysanthemum protects it by placing a round braided straw cover a few inches above it to protect it from snow and sleet. If the cover were placed directly on the chrysanthemum, the long, delicate petals would be crushed, so it must be placed above the petals. The cover is probably held in place by a tripod structure, the most popular traditional structure for shielding plants and flowers from rain, sleet, and snow. This morning the straw cover is itself covered by several inches of new snow, making the chrysanthemum below look even fresher and more vivid than usual. Big chrysanthemums take a long time to raise but only bloom for about a month, so seeing the flower surrounded by fresh snow must have been a sight worth waiting for. The owner of the chrysanthemum probably thinks of the straw cover first of all as a plate for making offerings to gods and for use in purification ceremonies, which were things most households carried out fairly frequently, though it's not clear whether a prayer is implicit in the owner's use of an offering plate as a cover. Is the straw plate itself also making an offering of snow here? The round straw cover the owner has placed over the chrysanthemum is called sandara-boshi by Issa. This is a variant of the more common sandawara. Both words refer to the fairly stiff round braided straw covers, about a foot in diameter, that are tied over both ends of traditional Japanese straw bags for carrying and measuring rice (tawara). Straw bag covers were commonplace in Issa's time, and Issa's reference to them is pointed out in Issa's collected works 3.345 and in Maruyama, ed., Seventh Diary 2.103. Rice was a precious commodity, and the tightly tied covers ensured that no rice would leak from the big bags. The -boshi at the end of sandara-boshi is not related to hats (boushi). It is a suffix meaning "person" that personalizes a noun in much the way that adding -san personalizes many nouns in Japanese, thus allowing a more a more intimate way of talking. In addition to serving as rice bag covers, the straw covers were also used as sacred trays on which objects were placed as offerings to gods at Shinto shrines. They also served as boats on which paper dolls were floated away on streams and rivers during the Doll Festival on 3/3 and at other purification ceremonies. 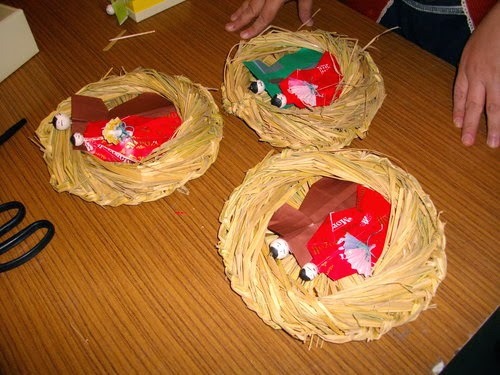 This is straw covers with their undersides turned up being transformed into boats that will carry away paper dolls during the 3/3 purification ceremony. The hokku seems to contain a bit of personification, and its focus seems to be on the straw offering plate that is now offering its services to the chrysanthemum flower a few inches below it. It is not placed directly on the flower, since that would crush the chrysanthemum's delicate petals. In order to help the chrysanthemum bloom well, the straw plate acts as small flat roof. Today the offering plate finds itself drenched and covered with sleet, and it is no doubt faded from the rain and snow of many storms, but to Issa the sleet-covered straw plate may have a beauty of its own, as if it were offering the sleet piling up on it to the god of chrysanthemums as its prayer for the continued health and beauty of the flower. 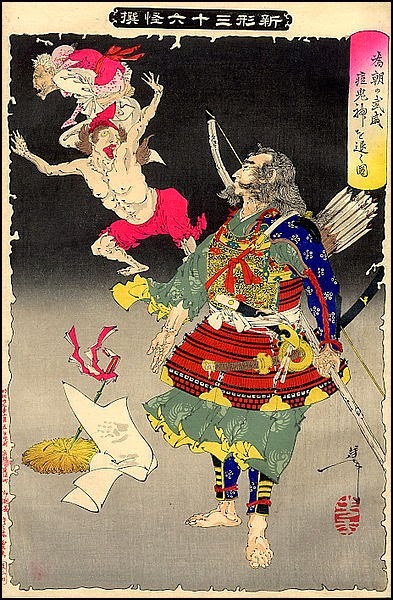 It was believed that the god (or gods) of smallpox both feared and liked the color red, so red objects along with offerings of rice, sacred Shinto streamers, and other objects were put on straw offering plates and placed beside roads at the edge of a village or floated off on a local stream or river as prayers asking the smallpox god to leave or at least not stay long. In Issa's hokku, a straw plate with offerings and red objects on it has been sent off down a stream, but before it can get very far a frog leaps up onto it. Is Issa worried that the frog will get smallpox? Or is he smiling, imagining the god's expression when he sees the frog? Six years later, as described in Year of My Life, the situation is more somber. When their infant daughter gets smallpox, Issa and his wife go to a nearby stream and float out on it a straw plate with very fervent prayers and offerings to the god of smallpox. The photo shows a typical offering to the smallpox god on a straw offering plate that can either be placed by a road or shrine or floated off down a stream. In this case a representation of Daruma (Bodhidharma) performs the task of showing red to the god. The white Shinto streamers are used for purification. The rice is for the smallpox god to eat. This print by Yoshitoshi shows the famous medieval warrior Minamoto Tametomo driving away the smallpox gods, here portrayed as a couple. He has placed a straw offering plate on the ground in front of him in order to make his prayer. On it is a branch with red and white Shinto purification streamers. Tametomo has managed to get the smallpox gods to formally promise never to visit his house, and the paper on which the pledge is written lies on the edge of the straw plate. The handprint of at least one of the gods is visible on the document, guaranteeing its validity.